Yokto is great way to add mobile ready HTML5/Flash video to any website or blog, without ever having to write a single line of code, for free! Collect videos & presentations from all over the web (YouTube, Vimeo, Dailymotion, Ustream, Brightcove, Photobucket & SlideShare), link to and upload your own videos and combine them ALL into a single, easy to embed player that plays on any device – web, mobile and tablet! There’s a wide range of players to choose from, all of which feature built-in social sharing tools and powerful video analytics. Users can connect directly to their own Amazon S3 or CloudFront account. Unlike other video platforms we don’t charge a penny for bandwidth or storage, manage your costs through your existing AWS account and serve video straight out of the cloud, at cost! Yokto is a totally free video platform, bringing enterprise level video management and distribution, to everyone! Our simple drag and drop interface makes creating and managing players very easy. Our focus on creating beautifully styled video players sets us apart from many of the other video solution providers. 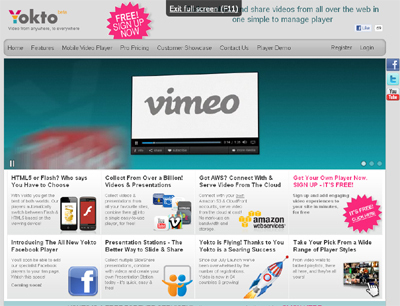 Yokto lets you quickly and easily create engaging channels of content. With just a few clicks you can combine content from all around the web. We think that’s pretty special, but what do you think?